Very good service. She knows what she is doing. Just got my second pair of Silhouettes from Kay. WOW! These new lenses are incredible The progression is smoother and clearer than ever and they have the latest blue blocking technology from Kay's lab. As always, the fit and comfort are impeccable. Thank you Kay! You're awesome! I’ve been wearing glasses for about 68 years all told… since the 5th grade. That’s quite a few pair. And I can say without a doubt K’s Optical has given me the best service, the best quality of frames and lenses of anyone else in all of those years. Kay is always helpful in helping me pick out the frames that best fit me and my needs. 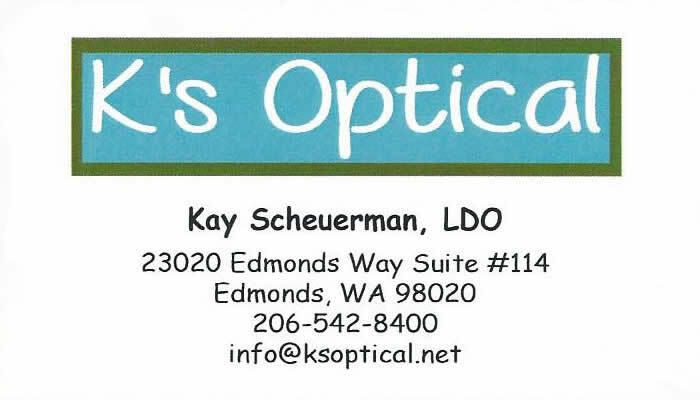 If you are just getting your first pair of glasses or you are like me, been wearing glasses for decades… I highly recommend you visit Kay at K’s Optical… you can’t go wrong! Kay is extremely friendly and knows her inventory very well! She has the best selection if you want to get glasses that are unique. She is knowledgeable and will help you find the perfect frames for your face. Great selection & Kay is wonderful at framing your face. You Rock Kay thanks! This was my first experience at K’s Optical. Let me start off by saying I will definitely be back. Kay provides exceptional service and helped me find the prefect glasses for me. By the way, she also helped me save a ton of money on my Silhouettes. Thank you Kay! This was my first experience at K’s Optical. Let me start off by saying I will definitely be back. Kay provides exceptional service and helped me find the prefect glass for me. By the way, she also helped me save a ton of money on my Silhouettes. Thank you Kay! K's has the best quality at the best prices! Kay's optical! Fabulous,personalized service. Wonderful selection brand name designer collections! If you want someone you can trust to make you look good see Kay...Five star all the way!!! Knowledgeable, Friendly and Walks you through the process with ease. She's passionate about her business and that's always a plus. Great experience, highly recommended. I was in desperate need of a new pair of glasses. I visited K’s Optical and was pleasantly surprised by her selection of petite frames. Kay helped me find just the right pair. For the first time in decades, I prefer to wear my glasses instead of my contacts. Thanks Kay! Thank you Beth ! You just made my day 🤓. It was such s pleasure to help you !